DRA is opening the 2019 application cycle to provide investments through its available funding opportunities. DRA funding programs are tailored to address specific infrastructure improvements, help develop the Delta’s workforce and local industries, and enhance regional economic opportunities. Organizations and communities can apply online at funding.dra.gov. The application process runs through May 31, and funds are available in DRA’s footprint in Alabama, Arkansas, Illinois, Kentucky, Louisiana, Mississippi, Missouri and Tennessee. Communities and organizations are encouraged to work closely with their local development district office, which has staff members trained by the DRA, to assist with the application process. Information on state-specific funding allocations, funding program eligibility requirements and guidelines, and contact information for local development districts are available here. South Central Planning and Development Commission is seeking to fill a position of an Accountant. This position requires a minimum of a bachelor’s degree in Accounting or Business with at least two years of experience. Governmental or fund-based accounting experience is a plus. Written and oral communication skills and knowledge in Microsoft Office and Excel are required. Position will be responsible for preparing and processing agency biweekly payroll. This includes, but is not limited to, reviewing accuracy of all employee timesheets and preparation of various spreadsheets, forms and reports with payroll information. This position is also responsible for, but not limited to, preparing invoices for some federal/state projects, tracking & tagging of agency assets, monthly balancing of various bank statements and assisting with the preparation of some audit schedules annually. Applicant must have the ability to work independently and work well with others. Salary range is based upon experience and qualifications. Resumes will be accepted until position is filled. Send resume to: employment@scpdc.org or South Central Planning and Development Commission, P. O. Box 1870, Gray, LA 70359. EOE/AAE. January 4, 2019 Comments Off on We are applying for FY 2019 EPA Brownfields Assessment Grant! SCPDC is pleased to announce the agency is applying for a FY 2019 EPA Brownfields Assessment Grant that would allow it to take inventory of brownfield properties within the region, complete environmental assessment and raise awareness. If awarded, the $300,000 grant may be used to address sites contaminated by hazardous substances, pollutants, or contaminants (including hazardous substances co-mingled with petroleum) and petroleum. In South Central’s region are Lafourche, Terrebonne, Assumption, St. Charles, St. James, St. John the Baptist and St. Mary parishes. For more information, please contact our Brownfields Program Director – Lesley Long at 985-851-2900 or lesley@scpdc.org. 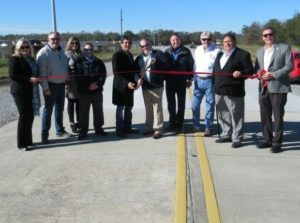 The Terrebonne Port Commission officially opened the Rome Woodward Street improvements with Parish President Gordy Dove, Councilman Al Marmande and Executive Director David Rabelais. The project is located on Main Port Court off of Industrial Boulevard. Port Commission members, Parish Council, representatives from T. Baker Smith (Engineering) and South Central Planning and Development Commission (Grant Administration) were present for the official dedication. The $425,706.00 project was a funding partnership between U.S Economic Development Agency (EDA) and the Port with $312,320 from EDA and $113,386.00 in port funds. The 800-foot infrastructure project, completed by Byron E. Talbot Contractor, Inc., included a 10-inch 24-foot-wide industrial class concrete pavement with 10-foot-wide aggregate shoulders and the addition of associated drainage pipe and catch basins. The extension finished the work started in January 2014 and provides improved access to the Port property allowing for an additional 52 acres of the property to be developed with Port related tenants. Aligning with many of EDA’s funding priorities, the Rome Woodward Street extension embodies public/private partnerships, national strategic priorities and global competitiveness. Terrebonne Port Commission’s 680-acre site located near LA Highway 57, the Houma-Terrebonne Airport, the Houma Navigation Canal and the Gulf Intracoastal Waterway puts it in a strategic position for future economic growth and benefits to the region. For more information about the Terrebonne Port Commission please go to www.terrebonneport.com.